Arctic sea ice is increasingly vulnerable to sunny days, concludes new research published in the journal Geophysical Research Letters. Kay and colleagues say the presence or absence of clouds now has greater implications for sea ice loss. The Arctic is particularly sensitive to changes in the extent of sea ice, which helps reflect sunlight back into space, cooling the region. When sea ice melts, the dark areas of open water absorb the sun’s radiation, trigger a positive feedback loop that worsens melting. When there is less cloud cover, the effect is intensified. Kay noted that last summer’s record low sea ice extent can be partially attributed to below average cloudiness in the Arctic. Overall, the September sea ice extent in 2007 was about 43 percent less than that recorded in 1979, when accurate satellite observations began. “Over a three-month period in the summer, the increased sunshine was strong enough to melt about a foot of surface ice. Over open water, it was sufficient to increase sea-surface temperatures by 2.4 degrees Celsius,” stated a news release from NCAR. Melting in the Arctic was so extensive last year that the fabled Northwest Passage was open to navigation for the first time on record. 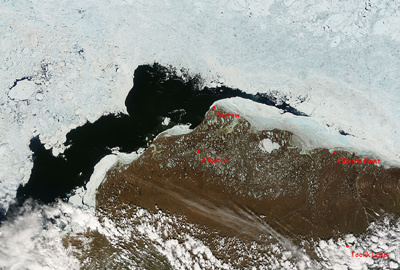 Scientists say the Northeast Passage — north of Russia — may soon also be navigable due to disappearing sea ice. The melting set off a scramble between Canada, Russia, the U.S., Denmark, Sweden and Norway which are all seeking to claim rights to the Arctic’s rich mineral and gas deposits. Environmentalists are concerned that the loss of summer sea ice could have dramatic implications for wildlife — like polar bear and walrus — that depend on pack ice for feeding.